Having a well-designed website to encourage conversions will serve you well on the internet. However, SEO, for some people, is too time consuming and is never really looked upon as a way to gain traffic. This is where pay per click advertising comes into place. One of the benefits PPC offers to advertisers is that it can provide fast instantaneous traffic. As well as this, the traffic is also contextual and specific to the campaign’s area of interest. When getting started with Adwords, there are a few things you may want to know. The first thing to make clear is that, for PPC, you should use Adwords. The majority of the population of America use Google as their primary source for searching about things on the internet. Therefore, it makes sense to use Adwords as your PPC program. When creating a campaign in Adwords, there are a few things you should know about and try to include to improve the performance of your campaign. A lead capture page requires the web user to fill in information about themselves. A click through page requires a click from the web user. An infomercial page requires nothing but the web user to take in the information on the landing page. Due to the variety of landing pages advertisers use, the definition of a conversion varies. 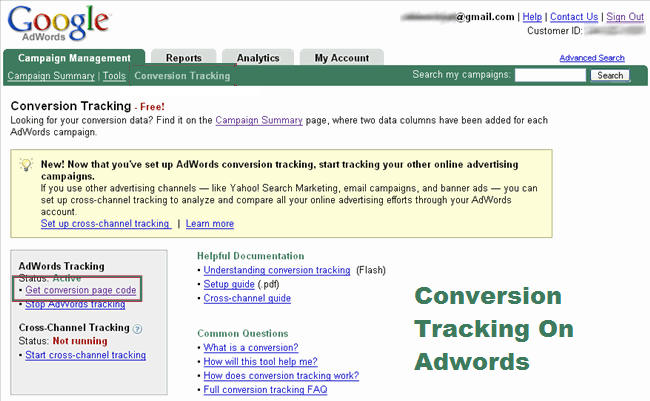 However, Adwords makes it possible to analyse your conversion. Through embedding conversion tracking code supplied by Google onto your ‘Thank you for purchasing’ or follow-up page after the conversion, you can record your conversion rate to analyse. In order to achieve a high click through rate on your pay per click advert, you need to know what it takes to make a good advert. The first thing you need to know is what audience you are targeting at. It is wise to carry out some secondary research looking into the types of people you are aiming your campaign at. As well as this, it is always a good idea to put in a few keywords you were going to use in your campaign into Google search to see what adverts appear. If you are feeling stuck, you can use some of the layouts of the text adverts to guide you though what you should place on your headline, description and URL. A great way any advertiser can improve their CTR is through including a call to action. A call to action is an action you want the web user to do (it kind of says it in the name). An advert that has ‘Order now!’ or ‘Collect Your Free Gift Now!’ in the headline or description will have a much higher CTR because in calling out an action, you will be encouraging the web user to evoke an action being the one you want: a click.